The La Vica campsite is up in the north of the island, nestling on the edge of the pine forests, just a bit south of the town of La Matanza. 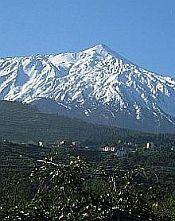 It is a bit of an enigma, because it is not featured on the list of campsites on the official Tenerife Council website. However, I have found another official website, from the Canarian Government, no less, giving full details of it. Next, the details given on this official page don't agree with information about it elsewhere. And, finally, I've not been able to locate it on any maps! Anyway, I'll tell you what I know and you decide. Both sources agree that the camping area is 10,000 square metres. Also, that there is parking space. The "unofficial" site then comments that there is running water andspecifically states that there are no toilets or showers. The official site, by contrast, gives the campsite's facilites as including one toilet, 16 "stoves" and nine tables with benches. This source says that there is no running water! I think, if you want to go there and you actually manage to find it (I'll give you as good directions as I can further down), it's best to expect the bare minimum of amenities. It's a small site, with a capacity for only 10 tents. As usual, there is the "recreation area", which closes at 7pm in winter and 9pm in summer. The campsite manager is Tenerife Council and can be reached on (+34) 922 239199. Here's how to get to the area where the campsite may be found (sorry I can't be more specific). Begin from the town of La Matanza de Acentejo. This is accessed from the TF-5 north motorway, at junction 23 (signed La Matanza). Once on this road, watch out for a small white building with a red roof, on the corner of where a road branches off to the left and take this left turn. Stick rigidly to this road (which is one-way in places). Eventually, you arrive at a T-junction where you may only turn left. Immediately after this take the fork to the right (signed Ravelo/Aguagarcia). This minor road will begin to climb into open countryside. Stay on this for ages. Watch out, eventually, for a bar called "Pico de Teide" and turn right immediately after. When you come to a "STOP" sign, turn right. You've reached civilization again, but all too briefly. Take the second left off this road. This takes you into the tree line. Eventually, you'll see a small sign saying "Camino La Vica". The campsite is somewhere in that area!